AirMate Attic Vents are made from extruded polystyrene with recycled content. These insulation vents help reduce heat buildup in the warmer months and increase the efficiency of your attic insulation during cold months. The improved airflow in your attic will help prevent ice dams from forming and forcing moisture under shingles. AirMate Vents are a full 48 inches long and snap apart for single or double width use. 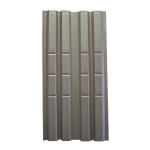 Lightweight and flexible, they are easily installed. Slide them into the soffit area and staple them to the underside of the roof sheathing, between the framing members. Be sure to slide the vents down far enough to keep the loose fill insulation out of the soffit area. The resulting air flow space will reduce heat buildup and condensation by allowing constant airflow through the attic. AirMate Vents meet or exceed HUD-FHA durable material standards and ventilation requirements. They are packaged 70 double pieces per plastic bag, are UPS-able and environmentally friendly.